This is the 24th anniversay year of the North Berwick Highland Games. The first Games held in 1996 had an attendance of about 4000 people mostly residents of North Berwick and the surrounding towns in East Lothian. Today, the Highland Games continues to attract considerable support from the local community but with more and more visitors coming every year an attendance of over 15,000 has become the norm. Visitors have come from elsewhere in Scotland, from throughout the United Kingdom and from all over the world. Many visitors appreciate not only the spectacle of the Highland Games itself, but also the opportunity to visit the charming town of North Berwick situated on the coast of the Firth of Forth just 25 miles from the centre of Edinburgh. The international visitors are not confined to spectators as many of the competitors, particularly in the Pipe Band competitions come from abroad. 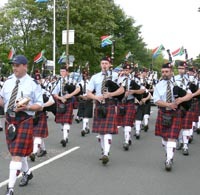 Last year the visiting pipe bands included the New Zealand Police, the City of Blacktown (Australia), the 78th Fraser Highlanders (Canada), The Royal Army of Oman, Benoni-McTalla (South Africa), and not forgetting local support from the North Berwick Pipe Band and many others. The Pipe Band competitions last thoughout the day with the junior bands competing in the morning and the senior bands competing in the Grade 1 Competition in the middle of the afternoon. The event includes the Lothian and Borders Pipe Band Championships, and during the day there is a separate competition for all the Drum Majors from the different bands to display their prowess in Formal Dress, Marching and Flourish. 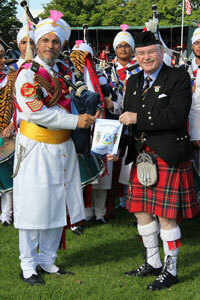 The Pipe Bands compete under the auspices of the Royal Scottish Pipe Band Association. Whilst the main arena and its environs echo to the sounds of Scottish music, the sports arena is reserved for more energetic pursuits. 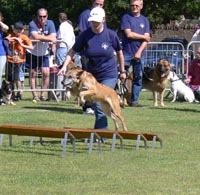 In the lunch time period, the arena is handed over to the Midlothian Dog Training Club whose members give us an outstanding display of the agility and obedience of their dogs. When the ground is clear the athletes take over for the Belhaven Best Heavy Events Championship. 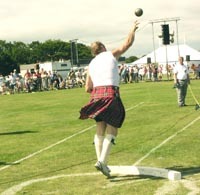 This includes six separate events including throwing the 16lb Scot's Hammer and Tossing the Caber with the Championship being awarded to the compititor gaining the maximum points combined from all six events. To see the huge, heavy timber caber being tossed is perhaps the most dramatic highlight of any Highland Games. Although the Pipe band competitions command particular attention during the day, there are many other activities taking place. In the south corner of the ground you will also hear the sound of the pipes but this time as an accompaniment to the Highland Dancing. 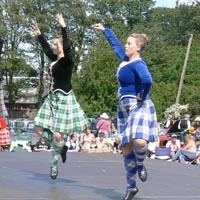 On an elevated platform you will be able to watch youngsters of all ages performing the intricate steps of the Highland Fling and Sword dances, whilst the older dancers complete in the even more demanding dances of the Scottish Lilt and Flora McDonald's Fancy. At the conclusion of the competitions, all the pipe bands parade into the centre of the arena (just!!) 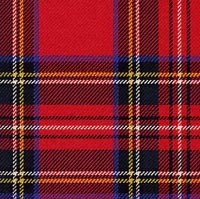 to salute the Chieftain of the day and then form up into a massed band of over 1,000 pipers and drummers. Together the bands play the traditional salute to the Chieftain of Highland Laddie. After the presentation of trophies and awards to the winners, the bands reform and individually march down through the streets of North Berwick - winning bands proudly displaying their trophies in front of them. Around the ground there will be a variety of craft stalls, side shows and children's amusements. There will be extensive refreshment facilities thoughout the day. It will be a 'Champion Scottish Day Out'.